Many of my regular readers know I design web sites for a living, so I believe I know what a quality, well-designed site looks and feels like. 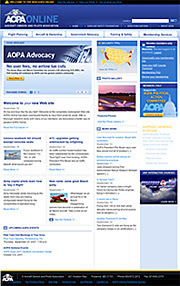 And in the last few days, AOPA.org went live with their new main site, and the makeover is – in my humble opinion – a thing of beauty. "The present AOPA site has served members well for more than a dozen years and was placed online as the Web was just developing," said AOPA President Phil Boyer. "While our Web site redesign was a huge undertaking, the time was right to recognize the Web technologies that have evolved." AOPA Online houses more than 50,000 files of information, including advocacy briefs, magazine archives, photos, news stories, safety courses, and software applications. You can read about protecting airports and airspace, learn about flying, get medical and legal advice, chat with fellow pilots, download charts, find airport information, check out weather and flight restrictions, plan a flight, buy insurance, and even appraise the value of an aircraft, all in one location. Five main tabs – for Flight Planning, Aircraft & Ownership, Government Advocacy, Training & Safety, and Membership Services – appear on every page of the new site, placing the information is where you expect to find it. The look is first-class as well, just more great work from the AOPA team of web designers that are second to none. This new site is just another sparkling example of why you need to be AOPA. I dare anyone – ANYONE – to click the "Email me here" link at right and tell me one good reason why any licensed pilot or student pilot should not be AOPA. In case you've been under a rock, we are in a fight for our lives on Capitol Hill, and AOPA, along with NBAA and AAAA, are manning the front lines of this fight. 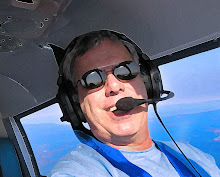 If you are not a member of AOPA, now would be a great time to change that by clicking here. If you want to visit the new site, click here. And if you want to engulf yourself in several days of aviation overdose, head to Hartford, CT. on Oct. 4-5-6 for AOPA Expo [registration info is here] where you may be able to talk directly with the AOPA team members that we all KNOW burned a tanker load of midnight oil to get this new site up and running.